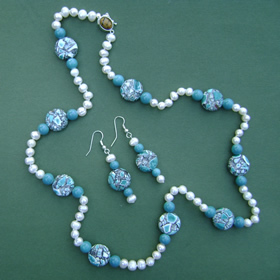 This necklace is designed with white 6mm freshwater potato pearls 6mm turquoise glass beads and 13mm magnesite stones. The 8x10mm sterling silver tigers eye cabachon clasp has a safety catch. The necklace is hand knotted for extra security. The matching earings are a sterling silver fish hook design.This longer look necklace is simply fabulous. 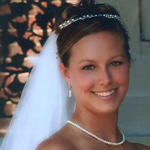 The necklace and earrings can be designed in your preferred lengths. 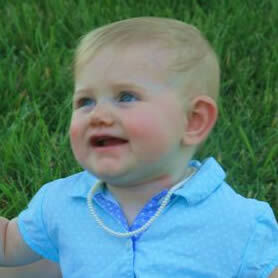 This double strand freshwater pearl necklace is designed with 5mm mint green and lavender rice pearls. The sterling silver 8x10mm malachite clasp with the safety catch compliments the color of the pearls.The soft pastel colors in this necklace are very flattering to the neck. 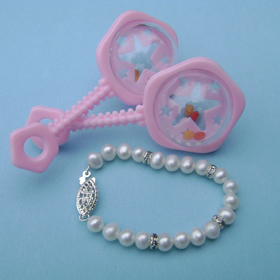 The matching earings are a sterling silver hook and eye clasp with four pearl drops. This necklace can be designed in your special length. 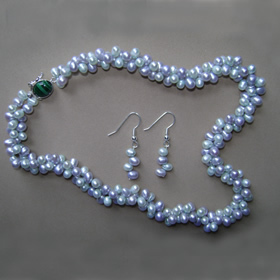 This triple strand of necklace is made of three colors are 10mm shell pearls: White, Tahitian, and Silver. The beautiful 3 strand iridescent white mother of pearl box clasp is of a 5 petal flower design with crystal rhinestones in the middle. The clasp measures 21x16mm - 36x30mm and of course should be worn on the side for a truly dramatic look. 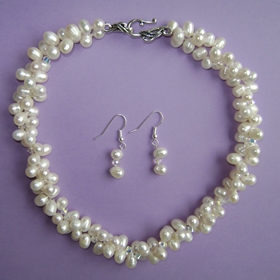 The matching earrings feature one of each of the gorgeous pearl colors, in a vertical drop. The earrings have a sterling silver shepherds hook. This necklace can be made in your preferred length. 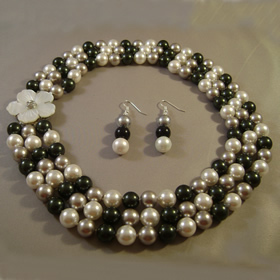 This necklace set is designed with 6mm white rice freshwater pearls and the finest Austrian 4mm Swarovski crystals. The large silver tone hook and eye clasp makes this necklace easy to put on and take off. 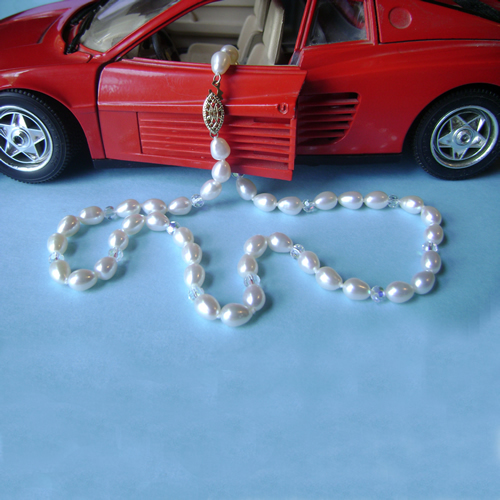 The pearls have a great luster and are hand knotted on silk thread for that extra security. The earings are a sterling silver hook and eye design with matching pearls and crystal drops. This necklace can be worn all year round for any occasion which makes this a favorite for my ladies. This necklace can be custom made in your own size.